Availability: Primarily via video. Accepting new directees. Available for supervision. Training and Experience: My life experience has many twists and turns. After several years working as an electronic drafter, I became a registered nurse and served in Bay Area hospitals for 20 years, primarily in the area of Maternal-Child Health. As my spiritual life deepened, I felt called to spiritual direction. I completed the Spiritual Direction Institute at Mercy Center Burlingame in 1997, and serving as a spiritual director has been a central focus for my ministry since that time. 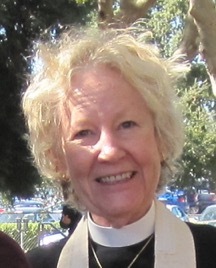 I graduated from Church Divinity School of the Pacific in 1999 and served as rector of a Bay Area Episcopal church for 13 years. Since retirement from fulltime parish ministry in 2014, I completed Mercy Center’s program in the Art of Supervision of Spiritual Directors—and relocated to Texas to be with family. I’m grateful for video that allows me to meet with spiritual directees and supervisees in other parts of the country and for the ability to meet in person at the Contemplative Center on my occasional visits to the Bay Area. Denominational Affiliation: My Texas childhood included worship in the Church of Christ, Baptist, Methodist and Presbyterian churches. As a young adult, I fell in love with the Episcopal Church and was confirmed in that tradition. A series of events moved me away from my fledgling faith, and I spent a good number of years exploring other spiritual traditions. Another series of events brought me back to faith and, ultimately, to ordination as an Episcopal priest. Specialties: I am especially interested in vocational discernment, formation in all aspects of life and support for lay and ordained ministers. The process of discernment around major life transitions particularly intrigues me, as does group discernment within institutions. I offer individual, couple and group spiritual direction, as well as individual and group supervision for spiritual directors. I lead spiritual retreats and am available for one-to-one retreat direction. deeply to give support, guidance and presence as people give birth to deeper awareness of God’s grace and love. My passion is for watching people becoming more and more who they are created to be and for witnessing the moment when a new experience of the Holy emerges in a person’s story. My life experiences have led me to unexpected places, and I delight in witnessing the Spirit’s action in the lives of people with whom I am privileged to companion. Personal information: I have two daughters and two granddaughters, with whom I love to spend time. My interests include painting, knitting, reading, playing the harmonica, choral singing, yoga, walking, “Kondo-ing” my house, occasional bursts of gardening, exploring new ways of being church, traveling and watching British mysteries.